Phil came quickly to give an estimate. He explained everything in a thorough manner being friendly and professional. He got the work done within my timelines and even did a little extra project! Will call Varco again when it's time to do my windows. VARCO offers an extensive line of double hung windows that are available with a variety of features and options for every need and budget. 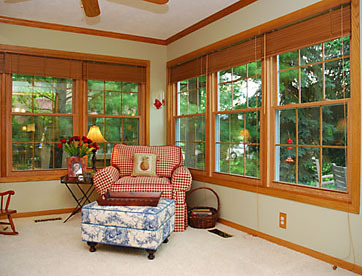 VARCO Double Hung Windows feature maintenance-free vinyl. They are also available in a wide variety of painted exterior colors as well as interior woodgrain and paint/stainable laminate options. Our double hung windows are made from uPVC or virgin vinyl to assure the highest quality, makign them maintenance-free. They will never need painting or scraping, and will not rot, chip or peel. Structural integrity is built into every Double Hung Window. Our select manufacturer’s vinyl double hung window frames feature multi-chambered, Parallel I-beam Construction to provides strength, durability and longevity. Fully-welded and weeped sills make our double hung window welds 300% stronger than the industry's standard windows, while providing excellent water resistance. VARCO Double Hung Windows provide convenience you can count on. All our double hung window sashes tilt-in for easy and safer cleaning from inside your home. Locking Zinc Tilt Pins also prevent accidental sash displacement during window cleaning. Our manufacturer’s vinyl double hung windows feature a weight management system enabling you to open and close the double hung window's sashes with ease. The balance system is made with similar cord materials used in mountain climbing. This system works on direct vertical force causing less friction than other window balance systems on the market. Energy Star Qualified Double Hung Windows.